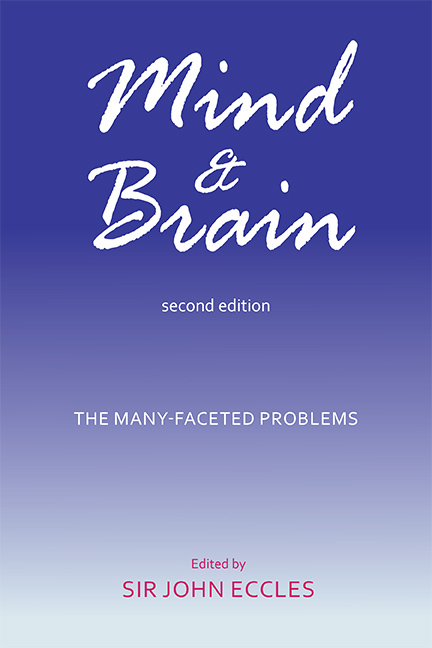 A now-classic discussion on the mind and the brain. Does the mind reside in the brain, or does the brain act as an interpreter of the mind? What is the nature of consciousness? Sir John Eccles, wo was awarded the Nobel prize in medicine in 1963, authored several of the articles in this book and pulled together a wide range of scholars, East and West, and from the disciples of philosophy, neuroscience, anthropology, psychology, physics, and biology. Includes interdisciplinary discussion on chapters. SIR JOHN ECCLES, winner of the Nobel Prize for his study of nerve transmission, edited the volume and authored many of its articles, including Unity of Consciousness and Mind-Brain Theory, A Critical Appraisal of Mind-Brain Theories, The Human Brain and the Human Person, Cerebral Activity and the Freedom of the Will, Culture–The Creation of Man and the Creator of Man and Natural Theological Speculations on Death and the Meaning of Life. Other contributors include: W. Norris Clarke, Duke L.VP.R. de Broglie, William Horsley Gantt, Ragnar A. Granit, Holger Hyden, Harry J. Jerison, Marius Jeuken, Brain D. Josephson, H. B. Jones, Benjamin Libet, H.D. Lewis, K.B. Madsen, Grover Maxwell, Diane McGuinness, Kai Nielsen, Karl H. Pribram, J.W.S. Pringle, Ravi Ravindra, Mary Carmen Rose, Bradley T. Scheer, Roger Sperry, Gunther S. Stent, W.H. Thorpe, J.W.N. Watkins, Roger W. Wescott, and Robert J. White. 13. Subjective and Neuronal Time Factors in Conscious Sensory Experience, Studied in Man, and Their Implications for the Mind-Brain Relationship. 17. The Evolution of Sexual Consciousness: Was Darwin Conscious of His Mother?